Go Go Garbage Truck is a very simple game I created for my toddler, who has a love for both garbage trucks (and other equipment), and pink-colored felines. 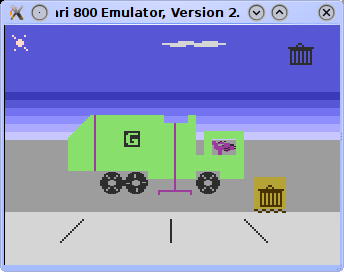 While more of a toy than a "fun game" or educational experience, it could be used to teach cause-and-effect, and shape matching: use the joystick to control the truck, and try to collect the correct garbage and recycling bins. GGGT was written (so far) in an evening and an afternoon, on an Atari 1200XL with the Action! programming language. It should work on most real Atari 8-bit computers and emulators, and does not require an Action! cartridge to run.